At Canfor, we know wood-based products can build a better world, whether it's a component in your smartphone or skyscrapers built from wood. We founded our entire company on that idea. Because, we know that wood-based products are sustainable and the opportunities to innovative have only just begun. We know when managed responsibly, the forest is everlasting and Canfor is committed to using virtually 100% of every tree for lumber, pulp, paper, and renewable energy-so nothing goes to waste. You can find Canfor products in every corner of the globe. We're especially excited by the innovative ways some of our customers are using our products. We know that the work we all do at Canfor today will shape what the world looks like tomorrow. Whether that means building a house or a skyscraper, using paper instead of plastic or learning something new from a colleague down the hall or around the globe. 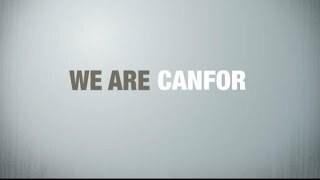 We know not everyone thinks about their impact on the world but at Canfor, we do.